Touting it as the biggest change to iOS since the launch of the first iPhone, Apple on Monday took the wraps off a drastically redesigned iOS 7 that marks a new direction for the company's mobile operating system. Virtually everything about the look and feel of iOS has changed with version 7, including a refined typography, all new icons, and a dynamic color scheme. The new operating system was spearheaded by Apple's lead designer Jony Ive, and engineering head Craig Federighi. 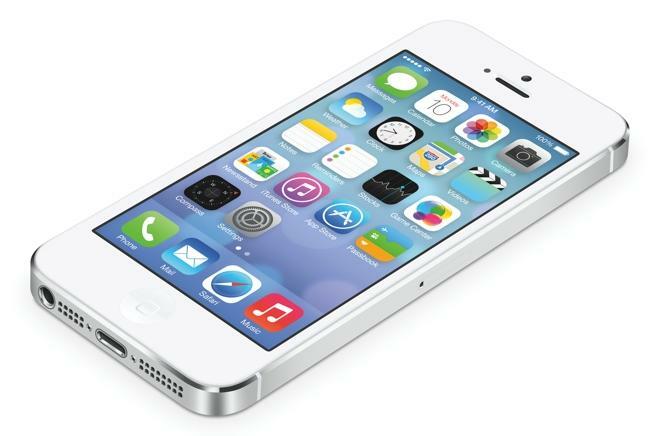 "iOS 7: The biggest change to iOS since the iPhone," Apple Chief Executive Tim Cook declared. iOS 7 features a completely new look from the ground up, but also packs a number of new features like AirDrop, Control Center and automatic photo organization. As you move an iPhone in your hand, a new parallax feature will actually move the wallpaper in the background, allowing users to "see behind" the icons on their home screen. All of the built-in applications have been completely rebuilt with a new look, including Messages, Calendar, and even the phone application. "Game Center: We just completely ran out of green felt," Federighi joked. "And wood as well. This has got to be good for the environment." In a demonstration of the new weather application, Federighi showed how dynamic weather effects are shown in the background, giving a visual representation of the current conditions. A new gesture allows for easier one-handed use, letting users swipe from the left side of the screen to go back. Folders have also been expanded to allow multiple pages and hold more applications. "iOS 7 is the most significant iOS update since the original iPhone," said Federighi, Apple's senior vice president of Software Engineering. "To create it, we brought together a team with a broad range of expertise from design to engineering. 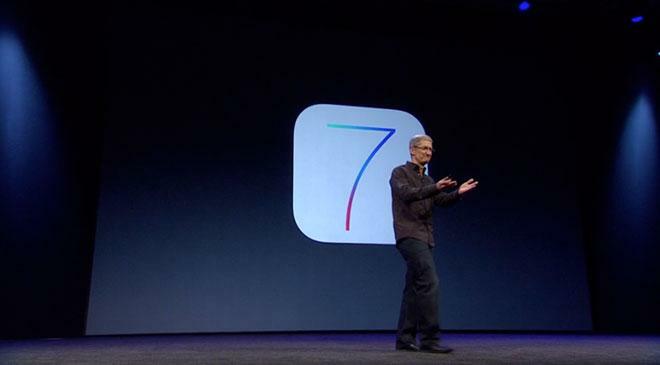 With what weve been able to achieve together, we see iOS 7 as an exciting new beginning." An updated notification center is slightly transparent, removing its previous textured appearance. Notification Center is also available from the lock screen as well, without the need to unlock the device. 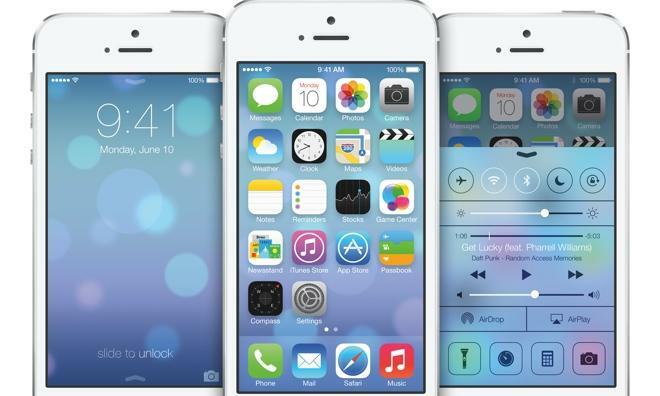 iOS 7 will arrive this fall for iPhone, iPad and iPod touch. 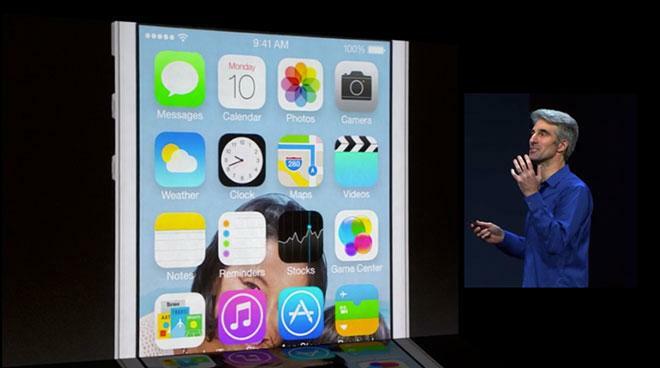 "It's a comprehensive, end-to-end redesign of the complete user experience," Federighi said. 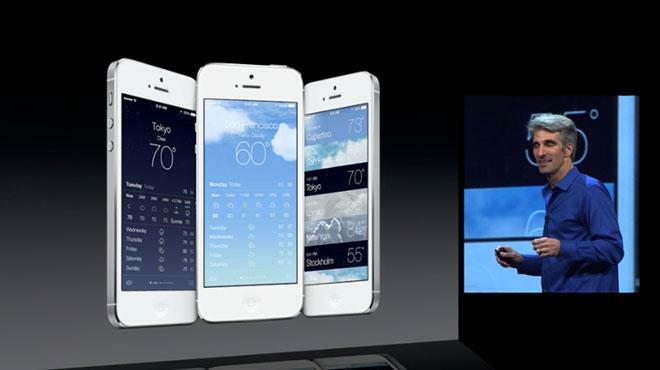 In addition to an all-new look, iOS 7 is also a major feature release, he said. Among those features is Control Center, which allows quick access to settings like Airplane Mode, Wi-Fi, Bluetooth, brightness, and even a built-in flashlight. Control Center is available from anywhere, including the lock screen. Multitasking has also been enhanced "for all apps with great battery life," Federighi said. iOS 7 notices users' pattern of use, giving applications background cycles based on how often users access them. Swiping between open applications is now a full-screen affair, offering users a larger preview of the application as it is currently open. An updated Safari for iOS 7 has a new full-screen mode that allows users to focus on content. A smart search field also has one-tap access to favorite websites, along with a new tabbed interface. And users are no longer limited to just 8 tabs. New AirDrop functionality will allow users to quickly share content with friends nearby with peer-to-peer Wi-Fi. 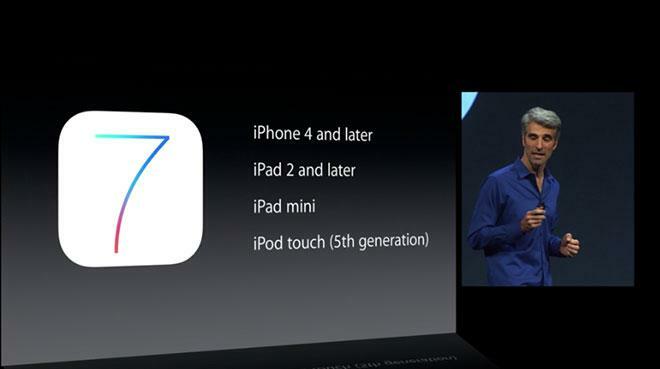 AirDrop will be supported on the iPhone 5, fourth-generation iPad, iPad mini, and fifth-generation iPod touch. "No need to wander around the room bumping your phone with others," Federighi joked. An updated Camera application comes with built-in filters, while enhancements to the Photos application allow individual pictures to be organized into "moments." Photos are automatically organized based on data such as where and when they were captured. Users can even zoom out to a year-by-year view. Enhanced by the Retina display, users can "scrub" through their yearly photos to narrow down what they're looking for. And new Shared Photo Streams also allow group sharing of photos and video via iCloud. "There is a profound and enduring beauty in simplicity, in clarity, in efficiency. True simplicity is derived from so much more than just the absence of clutter and ornamentation  its about bringing order to complexity," said Ive, Apples senior vice president of Design. "iOS 7 is a clear representation of these goals. It has a whole new structure that is coherent and applied across the entire system."